Contact Team Gunther Kia today for information on dozens of vehicles like this 2016 Toyota Camry SE. This Toyota includes: SUPER WHITE ASH/BLACK, FABRIC SEAT TRIM *Note - For third party subscriptions or services, please contact the dealer for more information. * Drive home in your new pre-owned vehicle with the knowledge you're fully backed by the CARFAX Buyback Guarantee. It's not a misprint. And the odometer isn't broken. This is a very low mileage Toyota Camry. A rare find these days. Beautiful exterior. Clean interior. This Toyota Camry is so immaculate it is practically new. The Toyota Camry has been the best-selling car in America for twelve years now. The Camry is a massive success and with good reason -- it's got proven reliability, a quiet and spacious interior, good fuel economy and exciting exterior styling. For anyone who needs quiet, comfortable transportation for up to five people without breaking the bank, the Camry is invariably the place to start the search. 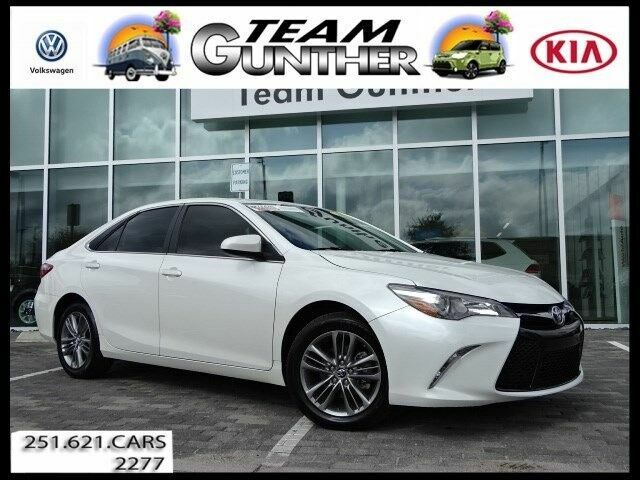 The Camry offers a ton of versatility for the price, but can also be optioned up to give buyers that luxury car feel if they so desire.Team Gunther Kia is pleased to be currently offering this 2016 Toyota Camry SE with 47,714mi. CARFAX BuyBack Guarantee is reassurance that any major issues with this vehicle will show on CARFAX report. The Camry SE has been lightly driven and there is little to no wear and tear on this vehicle. The care taken on this gently used vehicle is reflective of the 47,714mi put on this Toyota. The Toyota Camry SE will provide you with everything you have always wanted in a car -- Quality, Reliability, and Character. The Toyota Camry has been the best-selling car in America for twelve years now. The Camry is a massive success and with good reason -- it's got proven reliability, a quiet and spacious interior, good fuel economy and exciting exterior styling. For anyone who needs quiet, comfortable transportation for up to five people without breaking the bank, the Camry is invariably the place to start the search. The Camry offers a ton of versatility for the price, but can also be optioned up to give buyers that luxury car feel if they so desire. * All discounts applied advertised pricing is on in-stock units only and includes all applicable dealer discounts, manufacturer discounts, and incentives. Price excludes dealer fee, tax, tag, title, and electronic filing fee. Pricing may be based on financing through Volkswagen credit to qualified buyers. A copy of the advertisement must be presented at time of purchase to receive any special or advertised price. Prior sales are excluded. Cannot be combined with website offers. We attempt to update this inventory regularly; however, there can be lag time between the sale of a vehicle and the updating of inventory. Please contact us to verify availability.